There are many satisfying aspects of jobs that require us to lead teams and deliver projects. Yet they are careers that often include elevated amounts of stress. Or is it pressure? Our guests today will talk about the difference! 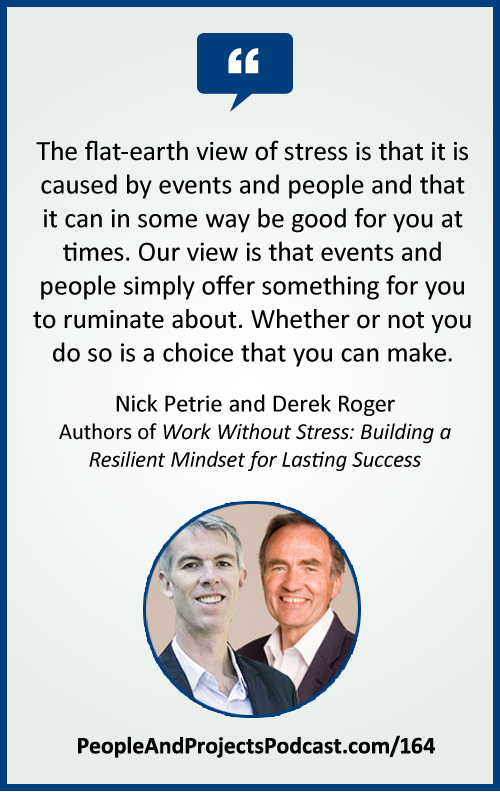 Nick Petrie and Derek Roger are authors of the new book Work Without Stress: Building a Resilient Mindset for Lasting Success. You can learn more about Nick at http://www.nicholaspetrie.com/. Learn more about Derek at http://www.challengeofchange.co.nz/about/derek_roger. SATIATE by Kevin Macleod Licensed under a Creative Commons: Attribution 3.0 License. CANDLEPOWER by Chris Zabriskie Licensed under an Attribution License. SUPERSTANDIN by Podington Bear Licensed under an Attribution-NonCommercial 3.0 International License.